Q. How many people can we bring on the charter? A. 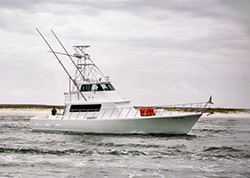 On single day charters up to 40 anglers. On overnight offshore trips for tuna, marlin, Wahoo, etc… Due to U.S.C.G regulations any trips exceeding 18 hours - the maximum amount of charter customers is 8. A. Whatever you want to eat or drink. We have a large “Green Egg” BBQ that customers are encouraged to use if they would like. Q. Can we bring our own coolers? Q. Can we bring alcoholic beverages? A. Yes, bring anything you want. But, we ask that you bring cans. Q. Do I need a fishing license? Q. Can kids come on the charter? A. Yes, definitely. We have all the proper safety equipment to accommodate children of all ages; however we recommend no children under the age of 3. Q. Can you accommodate people with disabilities? A. Yes. We have all the accommodations in place for customers with disabilities. Q. Do we need to bring any tackle? A. No. But if you wish to use your own tackle you may do so. Please try and limit your carry on tackle to no more than one rod & reel and one tackle box. Our boat is equipped with the best tackle available! Q. Do we get to keep all the fish we catch? Q. Do you offer fish cleaning services? Q. Do you take credit cards for payment? A. Yes, all major credit cards accepted. Q. Can I bring my own personal G.P.S.? A. NO! Anyone caught with a G.P.S. will loose it, and can be responsible for termination of the trip! Q. Are tips included in the cost of the trip? A. Normally no, but we offer some all-inclusive trips. Our mates work for tips, and a 20% gratuity is customary. Q. What about weather cancellations? A. Any trip cancellations due to weather are the Captain’s decision. The Captain will never put himself or his customers in harms way. 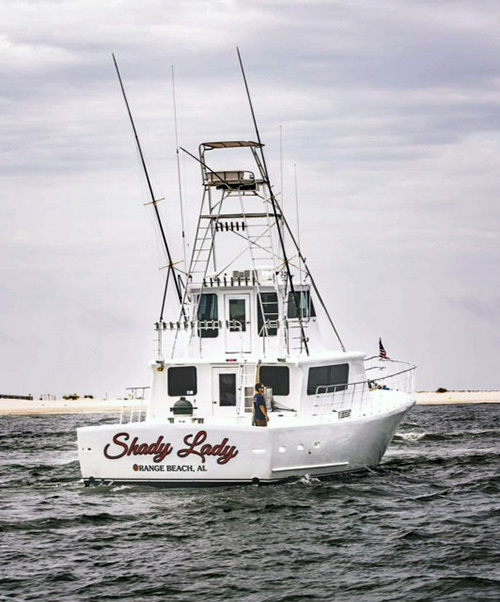 PLEASE keep in mind; it is our main objective, and we go out of our way on every trip to see that all of our customers have a wonderful fishing experience aboard the “Shady Lady”. BUT DO NOT MAKE ANY ASSUMPTIONS ON THE WEATHER OR SEA CONDITIONS. THE ONLY PERSON THAT CANCELS A TRIP DUE TO WEATHER IS THE CAPTAIN. Q. Can we bring any firearms? A: You have up to 20 days before a scheduled trip to cancel and receive a full refund.